Stop and smell the cherry blossom. Shenmue is a game with a reputation—both good and bad. It was, for a while, the most expensive videogame ever made. It sold less than Sega expected, and may have contributed to the sad death of the Dreamcast. To some it's an idiosyncratic, highly ambitious masterpiece. To others it's slow, boring, and barely playable. And, until this 2018 re-release, the only way to play the first game was on a Dreamcast. Or an emulator, I suppose, but it was mostly a miserable experience, with graphical glitches and poor performance. Of those two camps, I'm of the opinion that, for all its faults, Shenmue is a masterpiece. A singular game with a bold vision, and one of the most powerfully atmospheric things I've ever played—blocky geometry, weird controls, and all. Replaying it this year, at 4K with anti-aliasing and some neat bloom lighting effects, I felt the same way I did the first time I first booted it up. I was swept up in the melodramatic martial arts adventure of Ryo Hazuki, and beguiled by the game's vision of Japan in the '80s. A remake might have been nice, but I'm happy with the fact that, in the remaster, it looks just like it did on Dreamcast—albeit a little sharper around the edges. Well, smoother if you count the AA. Yokosuka is as captivating as ever: a beautiful, quiet, often gloomy slice of suburban Japan, with overcast skies, sleepy backstreets, and wintry weather. It's the perfect backdrop for the game's melancholy storyline of hopeless revenge and unrequited love. One of the most refreshing things about playing Shenmue today is how wilfully, glacially paced it is. This is an incredibly slow game, and part of the reason why so many critics bounce off it. But it's a perfect fit for the life of a teenager stuck in a small town, and when you're not chasing your father's killer, there's something magical about how mundane life can be. Shopping at the convenience store. Talking to the neighbours. Feeding the cat. 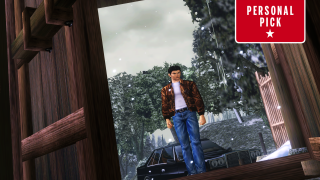 Shenmue is happy to just let you be, and not enough games allow that these days. I also love how familiar you become with the setting over time, and how it begins to feel like home. Because every NPC in the game has a routine, you start to become aware of peoples' lives. A person might go to a certain restaurant for lunch every day, or a shopkeeper will catch the bus home after pulling the shutters down on his store. This creates an incredible sense of place and community, and the feeling that this world exists without you. It's remarkable how such an old game can create this sensation, and so strongly. The second game is fine. I don't love it, but it's worth playing in preparation for Shenmue III. The sequel loses something in its increased scale, replacing the relatively small area of Yokosuka with the sprawling mass of Hong Kong—and other parts of China besides. But the first game works as a standalone experience, I think, and is worth buying this collection for. I won't be getting rid of the Dreamcast that's sat dutifully under my TV for the past decade, but now whenever I want to replay Shenmue (and that's often), I'm glad I can just fire it up on Steam now.